CC-2820 Cleaning Chart Holder 20½"W x 29¼"H For Arizona customers, you have the option to choose..
CC-1827 Revised Cleaning Chart Holder For Arizona customers, you have the option to choose PICK UP..
DOP-1711, Daily Operations Plan Holder with 4 mounting holes Made of durable PETG 0.60 17 5/8" W ..
DOP-L4R This Large Daily Operations Plan Holder features a new very helpful addition - the four thu..
DOP-S4R Daily Operations Plan Holder, Small This Small Daily Operations Plan Holder features a new..
DOPV-4C Daily Operations Plan Holder, Vertical Set This Daily Operations Plan Holder has 4 pockets..
SHEV-3 This E-Verify - Right to Work Sign Holder holds an 11" x 8½" poster. 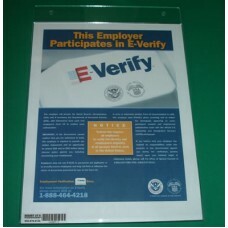 This poster is informi..
SHEV-2 This E-Verify Sign Holder holds an 8½" x 11" poster to inform your future employees that you..
SHC-119 Heavy Duty Horizontal Display Holder Holds regular (letter) size paper, 8½" X 11". 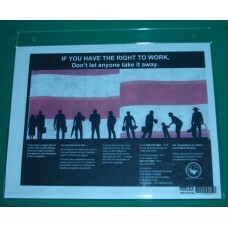 You ca..
SHC-911 Heavy Duty Vertical Display Holder Holds regular (letter) size paper, 8½" X 11". You can ..
DOPAR-814 Legal Size Display Holder with Red Strips This acrylic Display Holder designed to display ..
DOPC-814 Legal Size Display Holder, Side Loaded This acrylic Display Holder designed to display ho..
DOPA-814 Legal Size Horizontal Display Holder This acrylic Display Holder designed to display hori..
SHC-811-A Lightweight Horizontal Sign Holder, Flashed top. Designed to display a horizontal 11"W x..
SHC-811 Lightweight Vertical Sign Holder, Flashed Top This acrylic Sign Holder was designed to disp..
DOPV-3C Planning and Deployment Center This Planning and Deployment Center has 3 pockets to hold reg..
SHC-2016 Progress Chart Holder Designed to hold a 20" x 16" chart. Easy to insert and easy to remove..
FLRD-6 Red Back Board Holder with 6 Packets. Holds 6 regular size 8½" x 11" paper inserts Overal..
FLRD-4 Red Back Board Holder with 4 Packets. Holds 6 regular size 8½" x 11" paper inserts Overal..
SHC-811-1 Reinforced Vertical Sign Holder This Sign Holder was designed to hold standard letter si..
CB-1813 Speed of Service Tracking Board Overall Dimensions: 18"W x 14½"H Please select Double ..
TR-36 Thermometer Holder 3"W x 6½"H For Arizona customers, you have the option to choose PICK UP A..
SHC-1824 Training Poster Holder Designed to hold a 18" x 24" poster. Easy to insert and easy to remo..
WBH-1 Work-Book (Green/Red Book) Holder (Regular Size) also known as a Manager Book Holder. Outsid..